First of all, I am not panicking anymore. 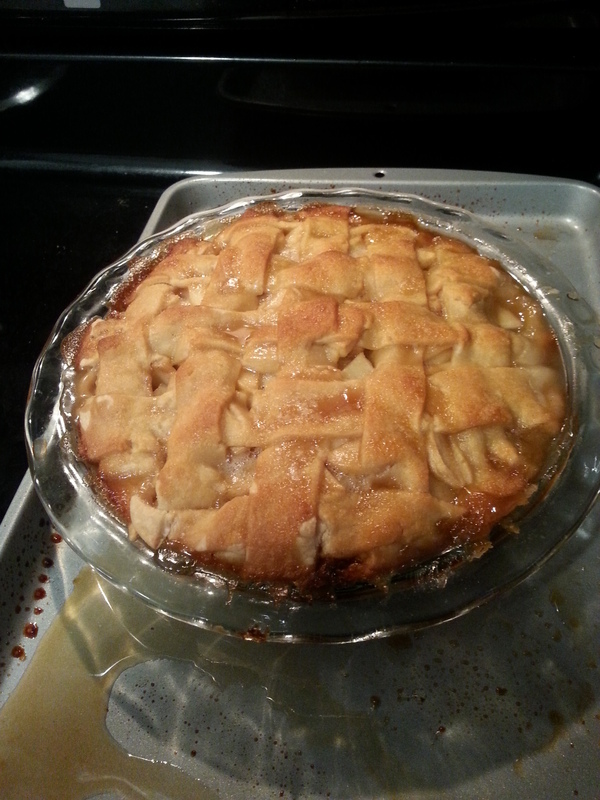 I made a pie for Easter, I got the chicken trimmed, butterflied, and pounded ahead of time, we made an awesome dinner for Growth Group, and I did indeed survive. Tuesday, I chopped my hair off. 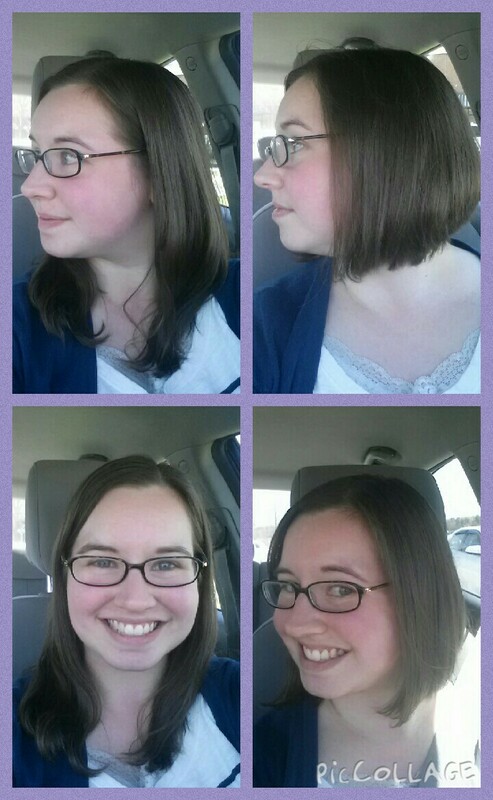 I cut it shorter than ever before… I can’t put it up, I have no idea how to towel dry it, and the lady buzzed my neck. I haven’t gotten Josh to take any pictures, so enjoy these before and after selfies! Wednesday night, Josh and I were super spoiled. My boss gave us a gift-card (completely out of the blue) to one of the nicest restaurants in town. We spent about a week studying the menu so that we could figure out what we wanted to order ahead of time (not even kidding) without suffering menu shock when we got the restaurant. This is the kind of place that even though we have a gift-card, I knew I was going to be sick looking at the prices if I waited until we got there to look at the menu (spending $30 for dinner is outrageous for us). 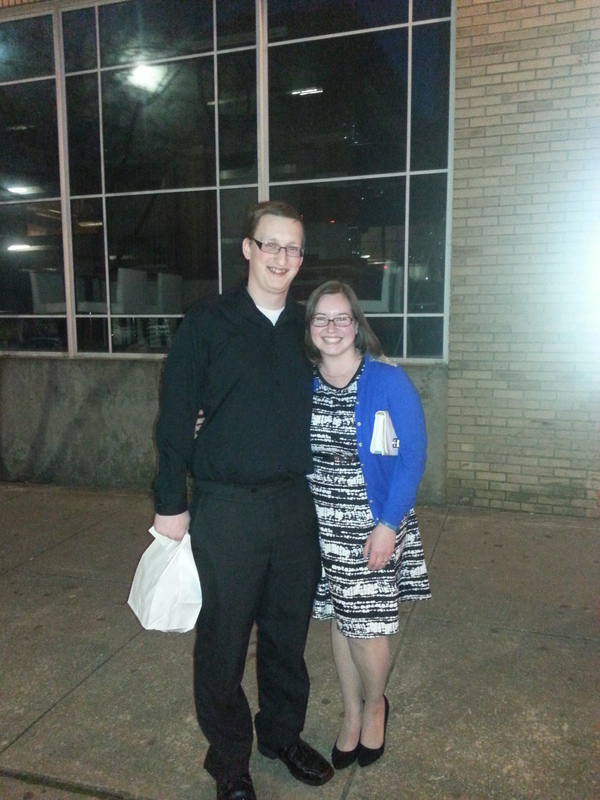 I came home from work, we got dressed up, and Josh whisked me away for a night out. We are so thankful for this gift– a night out together, ordering whatever we wanted, and it felt like I had an evening being Cinderella. We had shrimp, philly cheesesteak egg rolls (umm AMAZING), soup for me- salad for Josh, and steak with mashed potatoes. We also got dessert to go. Thursday (yesterday) was Aaron’s birthday! It is our tradition that the birthday person gets to pick whatever they want for dinner (within reason). So, I made breaded chicken for the first time (it was delish and a lot easier than I anticipated), white rice and wax beans (Josh and I had green beans), and an apple pie! I bought the crust (because ain’t nobody got time for that) and the pie was pretty darn good. I need to tweak the recipe some… the filling was kinda soupy and I’m not sure how to fix that. At any rate, it LOOKED wonderful. Aaron picked out some movies from RedBox, and I watched part of one– but ended up going upstairs and cleaned our room/packed for the weekend/watched American Idol. This week has been about getting stuff done. I feel like I haven’t spent much time at home, but I’ve spent a lot of time in the kitchen… which stressed me out, until I was doing it and enjoying it. This afternoon I’m leaving work early and we’re heading to Virginia Beach to spend the weekend with Josh’s family. I’m seriously excited (but only if Duke wins… if Duke loses it will be a dark storm cloud because these people are SERIOUS Duke fans). I finished the book I was reading (One Last Thing), so I’m moving on to “The Book Thief.” But… now I’m experiencing character withdraw. I know the story was wrapped up…. but I didn’t want it to end. Ahh. The terrible feeling of accomplishment and distress that awaits you at the last page of every book. HAPPY EASTER. I am spending most of Good Friday either in an office chair or the car… but I’ve been trying to reflect on the significance of this day. My Savior… giving his life to save mine. I hope you all have a wonderful weekend, but also don’t let the significance of this weekend get lost in the shadow of family gatherings, Easter egg hunts, and pretty dresses. PHEW. I feel pretty exhausted from this week, but I’m also so proud that we did it all. Date night was so fun. I’m really glad you like my hair! It’s so different, but I have super enjoyed the low maintenance of it. Thank you, thank you, thank you for helping me make Aaron’s birthday meal. I had some serious doubts that I could pull it off, and I couldn’t have without all your help. Thank you for the ways you love both of us, and the ways you help and serve us. I’m excited about spending the weekend with you, your family (who I call MY family and confuse everyone I know), and praying Duke wins… until Monday night, when they’re going to get beaten by Kentucky (sorry but it’s true, my bracket says so). See you in just a few hours, my love!